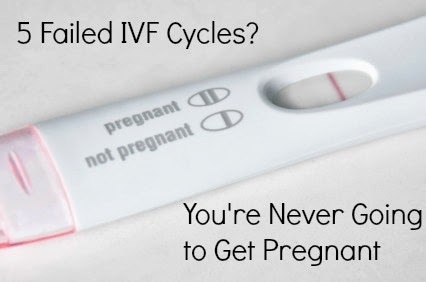 Dr.Malpani's Blog: What Steps can You take to Manage IVF Cycle Failure? What Steps can You take to Manage IVF Cycle Failure? Whenever a patient comes in for an IVF cycle at Malpani Clinic, it is evident that they have exhausted other treatment options. Their hopes ride on the only treatment left to them – IVF . Unfortunately sometimes they face disappointment with IVF as well, because it ends in a negative outcome. Not many of them can handle this situation and they find themselves in a state of despair and frustration. This causes unnecessary delay in planning out the next course of action, and thus further delaying conception. A practical plan chalked out earlier might help you during a difficult period. Failures are always tough to tackle but it is better to be prepared. A prior plan will not stop you from being sad but at least you would know how to deal with the sorrow and move on. IVF treatment is not guaranteed. There is always the chance that it might fail once - and in some unfortunate patients, many times as well . It is better to have a plan ready to help you in such a situation. Other than preparing your body for the procedure, you need to take steps for emotional preparation too. Principally, you should try and get as much reliable information as you can, regarding the treatment procedure. Once you know what to expect, you will be better prepared . It is also important to expect the worst and prepare for it. It is not pessimism if you plan for a negative outcome – it’s just being realistic. This will give you more confidence to face any result. Friends can be a great support during a medical crisis. They will give you the required warmth and comfort of togetherness . But if you have experienced a failed cycle, many friends might not understand what you are going through. They maybe Clueless about the details of the procedure, the stress it can cause, why it can fail, and what you can do next. In times like this, a person who has gone through the same hell as you have can give you the best support. An IVF buddy, often a fellow patient at Malpani clinic, would be the most ideal companion to help you regain physical and emotional strength. It can be difficult at times, but you need to train yourself to look at the brighter side . It is true that you failed a cycle, but there is still hope ahead. You need to distract yourself from the negative thoughts flooding your mind. Every patient might have her own way of looking at the outcome. You need to find your own positives and focus on these, for example, how doing IVF helped you learn how brave you are, because you were able to overcome your fear of blood tests and injections ! An IVF cycle failure can cause extreme emotional upheaval in your life, but simple steps , taken prior and after the procedure , can help you cope better . If you have failed an IVF cycle, and are not sure what to do next, please send me your medical details by filling in the form at www.drmalpani.com/malpaniform.htm so that I can guide you better !